Murcar has now reverted back to its original name "Murcar Links Golf Club" and has undergone alterations by Graeme J Webster and Team Niblick Ltd. In Spring 2006, the first phase of improvments stretched the layout to approx 6,500 yards. In 2005 Murcar hosted the BP Scottish Boys Matchplay Championships – Scott Henry successfully defended his title. Additionally the club hosted pre-qualifying for the 2005 Senior British Open and a European Challenge Tour event was held here in July 2006. In November 2014, the European Tour and Paul Lawrie announced a new match play tournament, which will be part of The Race to Dubai for the next three years. The inaugural €1million Saltire Energy Paul Lawrie Match Play was hosted at Murcar Links in July 2015 when Thailand’s Kiradech Aphibarnrat beat Robert Karlsson in the final. Murcar Links Golf Club was founded in 1909. Archie Simpson, the professional from Royal Aberdeen, designed the course. Simpson didn’t have too far to travel because Royal Aberdeen golf club is literally next door, and, apparently, he popped over to Murcar in his lunch break to get to grips with the design. As with so many courses of this era, Murcar was later revised by James Braid. 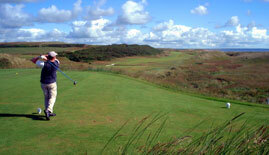 Located on a classic stretch of links land with huge sand dunes, crumpled fairways, whins, burns and heather. There are some magnificent views from the elevated tees across the North Sea and to Aberdeen City in the south. It’s a beautifully rugged course with lots of natural appeal. Murcar is not a championship monster, but it’s a seriously challenging course which belies its meagre yardage. From the back tees, the course measures 6,516 yards with par of 71. But the par fives disappear from the card when the regular tee boxes are used and par drops to a lowly 69. Murcar asks some serious questions. The hummocking fairways are sometimes cruelly tight and the ball has a habit of bouncing off the knolls and into vicious rough. Add this to the odd blind shot and you can find yourself leaving quite a few balls behind for the members. Having said this, the experience is engaging and the elevated tees provide that wonderful on-top-of-the-world feeling. The greens are most exquisitely sited on raised tables and amongst the dunes. There is little need for bunker protection around the greens, but to make life even more difficult there are pot bunkers sited there too. There are many strong and memorable holes, especially those in the dunes. The 7th is considered to be the signature hole, called “Serpentine”. From the high tee we can soak up the panoramic view of the North Sea, and then we realise why this hole is called “Serpentine”. This par four requires a drive over a looping, snaking burn, avoiding the ravine on the right and the vicious rough on the left. Somewhere out there, there’s a narrow fairway wedged between towering dunes. Now, let’s think about this one for a moment and take a deep breath. Perhaps it’s now time to find that old dog-eared ball that’s hiding at the bottom of the golf bag. When the wind blows, Murcar Links can be an absolute brute. Whatever the weather, this is a must-play golf course. It’s tremendous entertainment all the way round. Murcar is a wonderful golf course that is a victim of its location. It is literally next door to Royal Aberdeen and only 20 minutes from Cruden Bay. As such, we set the bodacious goal of playing all three in one day, in October no less. The folks at Murcar were exceedingly supportive of our goal. They let us out early, ahead of their regulars. Met us mid-round to see if we needed any assistance. We teed off just before 7:30 and were headed to Cruden Bay at 10:05. The course has an interesting pedigree. It was designed in 1909 by Archie Simpson, the keeper of the green and golf professional at Royal Aberdeen. A subsequent redesign was done by James Braid. It has lovely views of the North Sea. The first hole is a short par 4 and opens its arms to welcome you. The 3rd not so much, long par 4 with a split fairway. Based upon our challenges, I am not really sure what advice I should provide. The 4th looks like an easy par 5 at 489 yards on the card, not so much. It has an elevated green with a false front and severe slope left. The 6th is a neat par 3, called Plateau, it is protected with 2 pot bunkers right and an abyss left. The 6th is a long par 4 dogleg left and is the number 1 handicap. This is followed by the 423 yard par 4 7th named Serpentine. The tee box has one of the best vistas on the course. You can also see the stream snaking through the first half of the hole. As you make the turn, lower your expectations. As exhilarating as the front is the back cannot but help itself to be a little disappointing. The par 4 13th is 386 yards with a blind tee shot over the hill. My advice is to drive to the top of the hill, about 230 yards. All kinds of downside if you go much further. The 15th is a 383 par 4 with an elevated green and a stream running in front of it at the bottom of the hill. Be wary of the group in front of you teeing off to the right and bisecting the 15th to the 16th green. The 16th is super par 3 where your ball flight is just about perpendicular over the 15th hole. The 16th has a false front, but an interesting hole. I heartily recommend Murcar. I would go back and even pay to play it again. The rankings have it right, Murcar is not quite top 100 being a manifest level below those courses comprising 90 to 100. It's a decent course but feels tight and stifling. Too many blind shots for me (personal preference) and very undulating generally. Some top holes however such as the par 3, 5th and the wonderful par 4s, 7 and 13. A good course but no more than 4 balls in my view. Murcar is a championship links in the very finest Scottish tradition. This is unquestionably one of Scotland’s leading seaside courses. It has a character all of its own, forms a true test of the game and provides a stretch of magical golf on the front-nine that is particularly to my personal taste. A magnificent setting is created at Murcar by the way that the land gradually falls from the highest point on the course down to almost sea-level. This sloped-tiered effect not only gives us stunning vistas from virtually all parts of the course but it results in perfect terrain for exciting and exacting links golf. Gorse abounds throughout the links and the splendid view out to sea, where vessels wait in line to enter Aberdeen Harbour, is another constant. From the third to the ninth you are in the thick of the duneland, the best of the terrain, and for an hour or more I was in pure golfing heaven. The real beauty of Murcar, however, is that although the feel and character of the course changes on the back-nine the quality stays the same. The fact that Murcar, literally next door to Royal Aberdeen and less than ten minutes from Trump International, is sometimes overlooked by American visitors to the North-East of Scotland tells me two things. The first is that the strength of depth in this area is of an uber-high quality and secondly that the Yanks are missing out on one the best examples of links golf in the UK. Played Royal Aberdeen, Trump and Murcar on this trip and for me Murcar was the most playable and certainly the best value at well £100 per day. This is a short Links course which gives all handicappers a chance to make a score. The difficulty when laying it the first time is that there are a number of blind shots, so when going out keep an eye on the holes coming back because it can be a help. The opening hole is an ideal start and is a well bunkered par four of 322 yards. The view to the sea behind the green is an attractive vista of gorse and dune land heading down towards Royal Aberdeen. ‘Plateau’, the 5th, is the first of the three par threes. The green is up a steep hill and has bunkers to the right and at the rear. There is no fairway at all, so anything short can be a lost ball in gorse, heather or grassy mounds. The 7th, ‘Serpentine’, is one of the most demanding par fours you will ever encounter. From an elevated tee you hit over a burn which also runs in a wetland area along the right hand side between the fairway and the seaside dunes. The 16th hole is a good little par three of 160 yards. There is no bail out area anywhere here. You have to clear the burn and miss the two pot bunkers around the uphill green. The round finishes with two shortish par fours but beware left on the 17th and out of bounds on the well trapped 18th. Murcar is a real test and requires very accurate driving. One criticism would be the number of blind shots on the back nine which are especially difficult for the first time visitor. There is never a dull moment here. This review is an edited extract from Another Journey through the Links, which has been reproduced with David Worley’s kind permission. The author has exclusively rated for us every Scottish course that he played and featured in his book. Another Journey through the Links is available for Australian buyers via www.golfbooks.com.au and through Amazon for buyers from other countries. Warning! Do not play in the wind if (a) you are not used to links golf, (b) you hit it far, but you cannot control the ball flight or (c) if you have a higher handicap or generally hit it short. That the course it "not wholly suited to beginners" is an understatement, if there ever was one.However....if none of this applies to you, you are in for a visual and golfing treat. The course requires very precise ball placement if not brute strength and rewards you not only with fantastic views but with a sense of achievement once you have completed your round. Murcar, for me, was overall more enjoyable than Royal Aberdeen. Sure, the front nine of RA is quite beautiful, and is in immaculate condition, but the back nine, although tough as hell, did not present the same golfing buzz. Murcar on the other hand, held my interest from start to finish. I recommend this course for it's value too. Good test of golf by anyone’s standard. Doesn’t not have the polished feel like Royal Aberdeen next door but I don’t think they go after that either. This is the working mans playing club. Serious golfers play here, check out how many + figured golfers they have. Similar to RA in places but does have more blind shots and elevations. Holes 3, 7 & 15 are favourites of mine but in reality you can ill afford to relax for second. Many holes requiring well-driven tee shots and crisp approach play. Was the only day we experienced rain in 4 days golfing but it did not take away from what is a wonderful golf course. Rustic links at it’s best. It is unavoidable to compare Royal Aberdeen and Murcar since they share the same linksland and are contiguous. RA is definitely more conditioned and has a sensational front nine but seems to tail off in the back nine. Murcar is relentless, especially in a strong wind, and i feel has a greater number of memorable holes despite less spectacular opening and closing holes. We loved its wild nature and friendliness. Play as a pair! These vids show what it was like on a day when we were the only people to play the course. Can't wait to go back. dan https://www.youtube.com/watch?v=-L46UFOv7G4&NR=1 and https://www.youtube.com/watch?v=svuxR19tUx8. Having recently played both courses i have to disagree that Royal Aberdeen's back nine tails off. There has been a lot of work done on it over the past few years and is certainly no push over or weak. The condition of RA is outstanding at the moment way ahead of murcar. Murcar is a very good golf course with some fantastic holes through the dune land but there are to many weak holes 1,2,11,17,18 that lat it down for me. Two great courses back to back but RA is streets ahead overall. Royal Aberdeen's front nine are atonishingly spectacular on the eye, but I actually think the back nine is harder in many ways. I was saying that the back nine on Royal Aberdeen aren't as exhilarating as the amazing Front 9, whereas I feel Murcar keeps the adrenaline pumping. RA is clearly better conditioned, no question, and the back 9 is definitely hard enough, including the 18th which must be almost impossible into a strong wind. Dont be fooled by the relatively gentle start to Murcar Links. This course presents a serious challenge, and although not long by todays standards it is frequently chaperoned by a stiff breeze which can make the yardage figures a nonsense.There are lots of memorable holes on the course, particularly through the dunes from the 3rd to the 10th, and also the stretch 13 – 16 where there are some interesting changes in elevation and good views to be had.It can be easy to run up some high numbers if you stray off line as the course is tight in places, and the penalties are tough but not unfair by links golf standards. When i played the course it was in fantastic condition, having hosted the Scottish Amateur Championship a couple of weeks previously, and the greens were fast and true.There are good practise facilities at the club for anyone that wants to blow off a few cobwebs before venturing out, and the staff in the pro shop and bar couldn’t have been more helpful.All in all, well worth a visit if you are passing.